On July 18 this year a train loaded with flour was sent from Kostanay station on the route through Kazakhstan and Turkmenistan to Afghanistan. The length of the route Kostanay – Bolashak – Serhetabad (Turkmenistan) is more than 3,500 kilometers. As part of the organized train – more than fifty wagons with a cargo weight of 3300 tons net. “Kazakhstan holds the leading positions in the world for the production of grain. The main task of the railway is to ensure timely and high-quality transportation of agricultural products, including this strategic cargo. The development of transportation along the new route will increase the transit potential of Kazakhstan, reduce turnover and accelerate the return of rolling stock by 2-2.5 times,” Mukhtar Zhambulov, Deputy General Director for Operations of “KTZ-Freight Transportation” JSC said. From the beginning of 2018 for export 4.2 million tons of grain was delivered, which is 56% higher than the same indicator of 2017. Flour was transported 1.2 million tons, which is 8% more than in the past year. “”Ҳайратон” кўприги Афғонистонга неча миллион фойда келтирмоқда?” is a BBC Uzbek video about rail freight at Hayratan on the border with Uzbekistan, which was published on 30 November 2017. I don’t speak Uzbek so I have no idea what the commentary says, but there is lots of footage of the railway. Afghanistan has bought two locomotives of its own, according to a recent report about the Hairatan – Mazar-i-Sharif railway. This is significant because these are probably Afghanistan’s very first mainline locomotives. Afghanistan is expected to eventually take control of the railroad. It has already assumed responsibility for some tasks and purchased its first two locomotives. Source: U.S. works to get Afghans on track with rail network, Drew Brooks, Fayetteville Observer, 2 May 2014. Until now, rail operations in Afghanistan have (as far as I know) always been handled by Soviet and subsequently Uzbek/Turkmen railways locomotives from across the border. But what are the two Afghan locos? Russian enthusiast website Trainpix lists ТГМ4Б-0180 as having been built by the Lyudinovskiy Locomotive Works (now part of the Sinara Group) in 1990. As of 2013, it was owned by locomotive repair company Remzheldorteh at Yaroslavl in Russia, where it was for sale. So I wonder if the video shows one (or both) of the two locos which Afghanistan has bought? It would make sense for the Afghan locos to be shunters, as all long-distance rail traffic on the Hairatan line has to go to or from Uzbekistan anyway, so may as well use Uzbek locos. Unfortunately the number of the second loco in the video is not legible, and I don’t know what the presenter says about them, as I don’t speak the language. If anyone has any more information about these two locomotives, I’d be very keen to hear from you! An article at The Bug Pit, UN: NDN An Express Train For Afghan Drug Traffickers, draws attention to an October 2012 report from the UN Office on Drugs & Crime, Misuse of Licit Trade for Opiate Trafficking in Western and Central Asia: A Threat Assessment. This report contains information about rail transport in Central Asia, as well as lots of details of the movements of undesirable substances. Uzbek officials stationed at the [Hairatan] border are generally well trained and receive relatively high salaries. The risk of concealed drugs crossing the border undetected is therefore lower at the Hairatan BCP than it is in Naibabad. This issue has been raised at a couple of railway conferences I’ve been to in Turkey and the UAE, where it was suggested that providing decent jobs – particularly wages – for border officials in places like Central Asia can easily pay for itself in smoother regional trade, and also help to ensure that legitimate fees are charged and go where they should be going, rather than unofficial fees which disappear into black holes. It was even suggested that dealing with these matters might offer better benefits for the cost than funding fancy new transport infrastructure. The Hairatan [Border Control Point] primarily receives cargo arriving on the Termez-Hairatan railway from Uzbekistan. On average, 100-120 containers are sent to and from Hairatan BCP each day.26 Interview with Customs Officials at Dry Ports in Herat and Mazar-e-Sharif, March 2012. At the Hairatan BCP and Naibabad dry port, cargo is trans-shipped from trains onto trucks, which then travel along the assigned transit routes to Pakistan. The large river port at Termez ships approximately 1,000 tons of cargo daily to a location only 500 metres away from the Hairatan BCP in Afghanistan. the Northern Distribution Network.137 The railway line was only completed in 2010. The railway line has the capacity to transport 4,000 tons of cargo per month and can cater for eight trains travelling in each direction per day. On average, 100-120 containers travel the route every day.138 US Department of State, http://www.state.gov/r/pa/ei/bgn/5380.htm Although the road leading from Hairatan to Mazar-e-Sharif has recently been improved, it is not capable of handling high levels of traffic. Therefore, cargo continues to be delivered to and from Afghanistan primarily along the railway route. The railway dates from 1982, and “4,000 tons of cargo per month” sounds rather low; perhaps that should be per day, meaning 500 tons on each of those eight trains – or 250 tonnes if both directions are included? In 2007, Afghanistan and Turkmenistan signed a transport and transit agreement. […] Both countries also agreed to extend the Turkmen railroad network from Serkhetabad to Torghundi in the Afghan Herat province and to construct a trans-Afghan gas pipeline. The line is originally older than 2007, which was when Turkmenistan funded rebuilding and reopening it. There are two main trade and transit trade routes leading from Afghanistan to Turkmenistan. The first is a direct road and railroad link from Torghundi in Afghanistan to Serkhetabad in Turkmenistan. On average, the rail services at Torghundi transport around 50 wagons per day, while Torghundi dry port trans-ships containers delivered by approximately 300-350 trucks per day. From Torghundi dry port, Afghan goods can be delivered via Turkmenistan to the Russian Federation or the Islamic Republic of Iran. From the Islamic Republic of Iran, they are shipped to countries in the Persian Gulf, or through Turkey to European markets. A Mazar-i-Sharif – Andkhoy – Turkmenstan railway is still only at the planning stage. On a daily basis, approximately 50 vehicles cross the Imamnazar border in each direction180 Asian Development Bank, 2010, while a further 20-30 trucks cross at Serkhetabad. 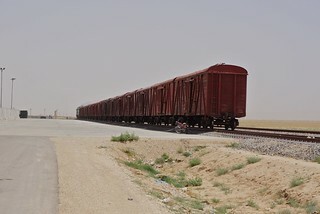 A photograph of a freight train taken on 29 May 2012 by Julian G Albert, who also has other photos of Traffic & Logistics in Afghanistan.